Giuseppe Porsile was born on 5th May 1680 in Naples. He grew up in a family of musicians and received his musical education at the Naples’ Music Academy. In 1695 however, Porsile was appointed by Charles II in Barcelona to become maestro di capella of the court chapel. Charles II died in 1700 whereupon quarrels and a war broke out as to who should be heir to the throne. When Charles III was crowned in 1703 there came no end to the upheavals, on the contrary, the conflicts deepened. During this period Porsile dwelled at the court in Barcelona. In 1711 Charles III was crowned as Charles VI, Emperor of the Holy Roman Empire. Porsile followed Charles VI to Vienna in the same year and stayed there for the remaining 39 years of his life. He died on 29th May 1750 at the Imperial Habsburg Court. Together with Johann Joseph Fux (1660–1741) and Antonio Caldara (approx. 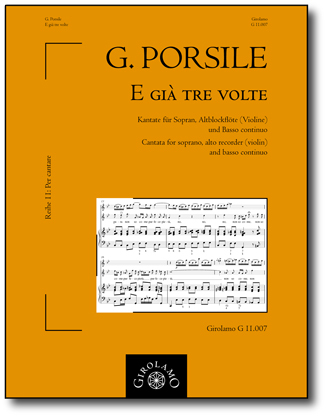 1671–1736), Porsile held a prominent post at the court being mainly responsible for the musical activities. He composed round about 20 operas and 13 oratorios as well as a considerable amount of cantatas and instrumental music. He also served as a singing-master to the Empress Elisabetta Cristina and her daughters Maria Josepha and Maria Amalia. Only very few of his operas were performed outside Vienna. Many copies of his cantatas nevertheless are to be found in Belgium, Germany, England, Italy and Hungary which points to the fact that these works were very popular. His expressive and passionate arias as well as his mastery of counterpoint were highly appreciated. Porsile was therefore the only representative of the Neapolitan School who managed to hold his ground at the Habsburg court. The cantata E già tre volte is preserved in the library of the Royal Music Academy in Brussels under the shelf mark Litt. F No. 15.155. It is the first cantata belonging to an anthology of 40 cantatas and 19 single arias comprised as manuscript in two volumes. Originally all works of the first volume had no signature. At the beginning of the first and five other cantatas however, the entry “de Porsile” was added by an unknown hand which can also be found in the table of contents. Considering that the copyist wrote his name under the work, one can assume that these works in the second volume were composed by Porsile. Thus we can conclude that E già tre volte also derives from Porsile’s hand. There is no indication as to which instrument should take over the solo part. Since the cantata is written in flat keys and the pitch range is from g#' to e''', an alto recorder seems a suitable choice. A violin or traverso however would of course also equally fit the part. This first edition is kept closely to the source. Adjustments have been made to the accidentals and the Italian spelling has been modernized. All further additions by the editor are indicated in the score and corrections are commented in the footnotes. da che un sol più vago non vidi. non so come pur fece pietà. mia tiranna la sorte non fa. al governo del cor restaron sole. il mio sol di riveder. since I saw a sun yet even more beautiful. such as I had set eyes upon. will not also succumb to it. when this beautiful sun appeared. and to whom I owe this utter joy.